High Wycombe, UK, 27 September 2016 – At Restaurant Tech Live 2016 (27 – 28 September, ExCeL, London), Evoke Creative will be joining Star Micronics on Stand 1150. 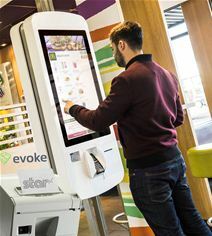 Evoke helps brands to engage with their customers in creative and innovative ways by designing and manufacturing interactive digital solutions, supplying kiosks, digital signage, self-service and software to retail, hospitality and libraries; major clients include McDonald’s and Debenhams. Evoke was recently approached to conceive the future of self service in-house for McDonald’s. Global demographic and cultural differences mean the product had to be as intuitive and approachable as possible whilst retaining a clean, friendly aesthetic. The volume of production and the potential global reach meant the product had to be produced efficiently, shipped and installed worldwide in the safest and simplest way and remain in operation in demanding environments 24/7. Evoke used its extensive technical knowledge to design an adaptable modular product range capable of handling multiple hardware options from the diverse markets the company operates in. The end product has set a new standard for self-service machines within the industry. Innovation at every stage of the process enabled Evoke to produce the best product at the best price whilst ensuring quality and reliability were kept as the highest priority. For printing receipts, Evoke turned to Star to provide a reliable, high performance printer that could handle the demanding environment in which the kiosk operates. Selecting the robust encased TSP700II, this printer provides the perfect solution for ease of operation in high value kiosk applications. Providing the same level of performance as an open frame printer, an encased printer is easier to install, service and maintain; factors that are driving their increased use in kiosks. Furthermore, the unique multi-functional capability of the TSP700II to print receipts, tickets, labels and barcodes at 250mm/second has driven its deployment in an ever wider variety of kiosk applications and environments.